btw Ceramics is a housewares company founded in Brooklyn and made in LA. 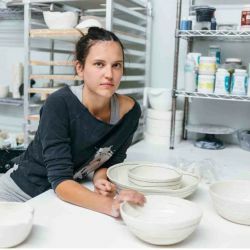 The handmade porcelain goods are designed by Brooke T. Winfrey to enliven and enrich your table and home. Brooke approaches each piece as its own creation where the irregularities are embraced and the moment to moment approach is captured. The unmistakable handmade feel of the pieces embraces the playfulness of clay and draws attention to the creation process. Each piece is individually hand built or thrown on the wheel and each dot, splatter and brushstroke is hand painted so that no two pieces are identical. The minimal shape of the forms accentuates the striking designs, allowing the artist's hand to be blatantly and proudly shown.